We receive unsolicited pictures and emails all the time! So many people rave about their results with our products. We appreciate each and every comment and image! A happy Speedy White customer sent us this image after retrieving his boat out of the water after nine years! We were as impressed with the results as he was. Works great on wood stove glass, grills, greasy kitchen stove fan filters, outdoor furniture, gutters and anything grease related. This is the best stuff ever!!! 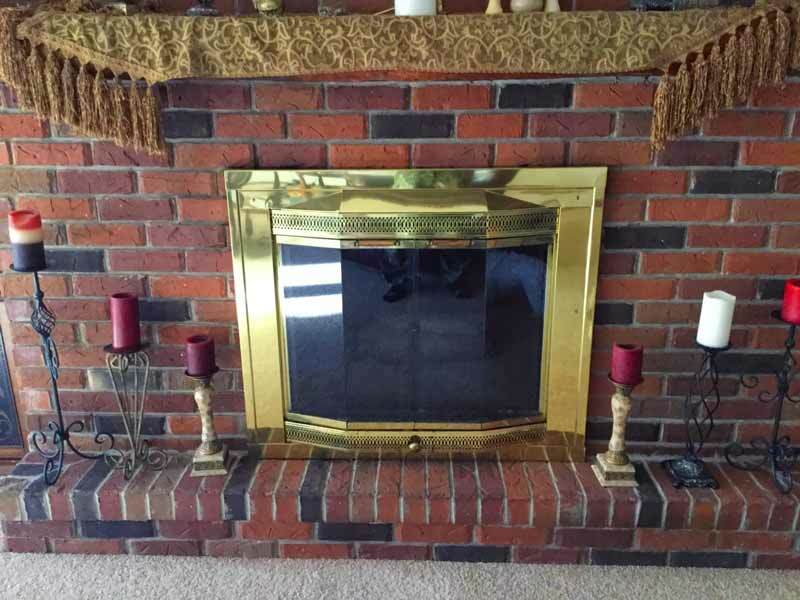 It took off the creosote and soot stains from around my brick and my brass fireplace insert. It even took off spots of old dried paint from the bricks!!! I could not believe it. The paint and the soot have been on there for at least 15 years, and after 5 minutes it was gone! I had considered buying other products on the radio or tv that you paint on and peel off, because I was worried about the mess. My husband thought I was crazy buying a spray product and getting it on the brass fireplace and the carpet. But it didn't hurt my brass and glass at all! Actually shined it up and cleaned the glass. Looks like new. I sprayed everything, and used an old tooth brush to agitate it around the soot and the paint spots, then I used paper towels and a wet rag to blot it up and voila, gone, and I only did one application. Can't wait to use this on my grill...going to be stocking up as this is the best darn cleaner I have ever used, and there is no smell and no harsh chemicals to worry about. See our before and after photos on how well this worked and how porous the brick we cleaned is. This stuff did and incredible job removing I-can't-guess-how-many-years worth of soot and creosote from our 1950 fireplace. When we took off the brass and glass cover off, I thought for sure we were going to have to paint the fireplace or put on a facade As a last ditch effor we bought a bottle of Speedy White based on the strength of its reviews. Almost a whole bottle, one large rag, some elbow grease, a red acrylic scrubbing drill attachment, and about an hour later and - voilà a whole new fireplace was revealed. This stuff was stinky - do your large project on a day when you can keep your space well ventilated, but wow, It took off years worth of grime, some old masonry stains, and significantly lightened some old paint splatter...This was money WELL SPENT on rehabbing our fireplace without having to paint or cover it. I highly recommend giving this a try. this stuff is awesome . I completely restored a badly soot stained stone fireplace/hearth in only an hour , and the plus side is I have enough left to do the job at least two more times . I balked at the price initially and actually considered returning it , until I tried it out. I love this stuff. This is the second bottle I have bought. It can clean so many things like my husbands favorite baseball hat, the fireplace hearth where my dog loves to sleep, the concrete step at the back door, the list is endless. I use this to clean the glass doors on my wood burning fire place. I just spray on and let sit about five minutes and then I use wadded up newspaper to wipe away the soot. If there is a build up, I repeat the process. In minutes the doors are shinning. I do place a sheet of plastic underneath to protect drips on the hearth. 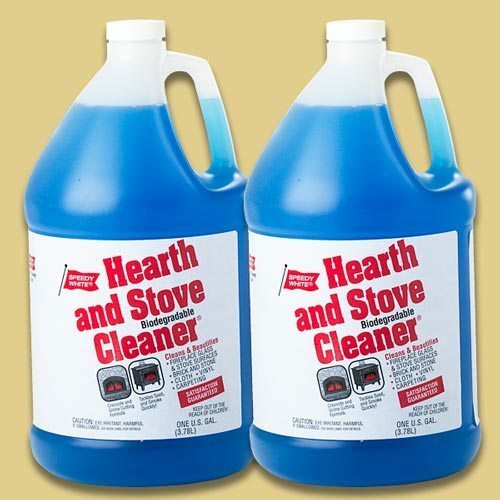 I have used this product before and love how well it cleans the glass on my woodstove without scratching. Highly recommend it to anyone with a glass view stove. Does a good job on soot especially on glass. Best thing we have found for cleaning pellet stove glass. This product works better than any others I've tried. It's a simple spray and wipe to clean the bricks, metal, and glass around our fireplace. There's no scrubbing or horrible smells. I had the fireplace spotless in 5 minutes after a winter of more than 20 fires. I'm sure it'll be just as effective on my grill. I've had modern design, glass door wood stoves on and off for 25 years and I've never encountered anything even remotely as good as this stuff for cleaning the soot and creosote off the glass. Even with oven or bar-b-que cleaner, you have to wait for it to dissolve the creosote from the glass, and the fumes are usually pretty nasty. This stuff, you spray it on, and by the time you can unroll some paper towels to wipe it off, the creosote is dissolved. With a little second pass with a Scotch brite sponge and you're good to go. Put a newspaper or something under the door, because this stuff is not foamy, it's liquid, and will drip. No big deal, throw the paper towels and the newspaper in the stove to start your next fire. I wouldn't use this on a hot stove, but on a warm one, it's fine. It's so thin that it will just evaporate too quickly on a hot stove. I don't think you want it on your skin, however, or your clothes. As benign as it seems, it has to be pretty caustic to do what it does. Rubber gloves maybe, if you have some. 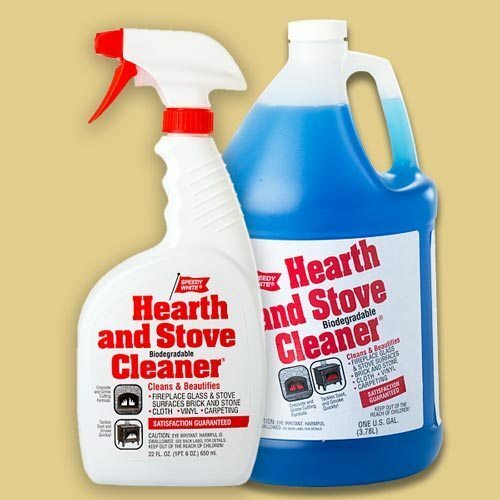 I have used this stuff for YEARS on my fireplace glass doors and it works GREAT!!! I keep buying it year after year! I would be lost without it - nothing else works like this stuff!!! Great product for cleaning stove and surroundings. Package came through great with USPS. This is the only fireplace glass cleaner I'll ever use. Looks like brand new and is very fast and easy to use. Also can be used on an electric stove glass top. Beautiful Stuff!!! The soot wipes away easily!!! My "Go To" Product now when cleaning my Fireplace Glass front! Cleans very well, you still need to use a bit if scrubbing power. It does work better Than other cleaners i have used. This product did a wonderful job. My glass fireplace doors look like new and they are 30 years old. I had creosote staining on my fieldstone chimney. Used two applications with scrubbing the stone. Speedy White took a good share off but still very visible. Saying that, it is the best product I have found. It easily removes removes soot from the glass to give me a clear view of our warning fire. Great product. 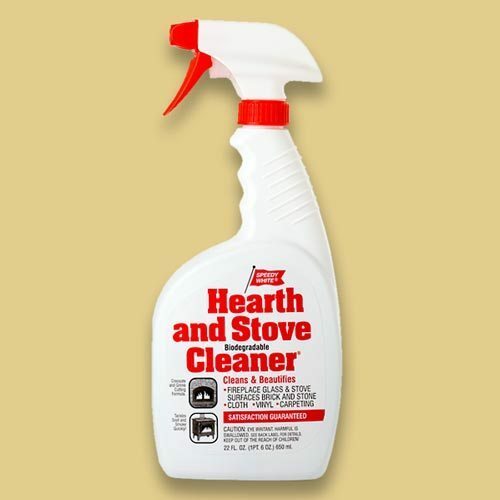 My husband said he has tried other heath and stove cleaners for the pellet stove and this one works the best. Cleans the wood burning stove window perfectly. We have used this product several times over the years, I have never found another product that works as well as this one. 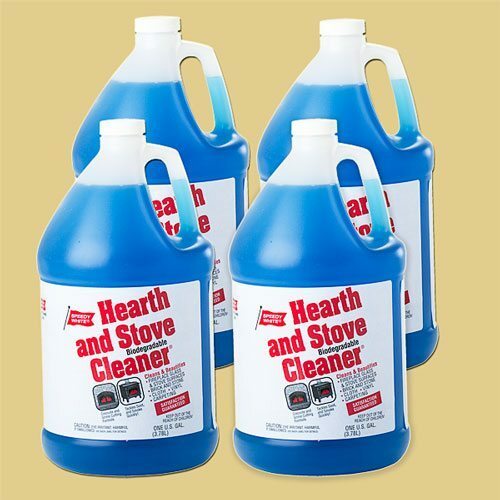 This is a great cleaner for fireplace insert glass and I also use it on my bricks. It gets my brick really clean. 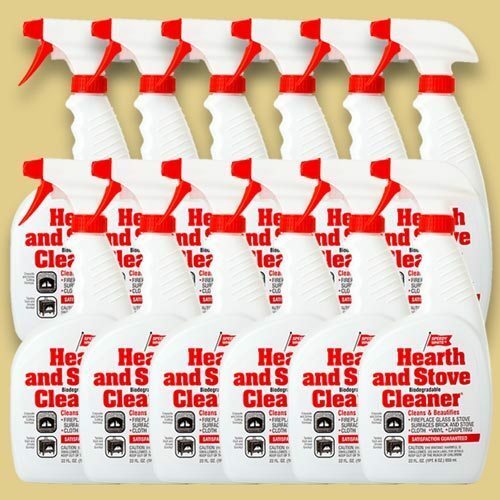 This is a great product and I have used it for a couple of years now because of the ease of clean up. Great product. Nicely cleans the glass view plate on our wood stove so that we can view the ambiance of the flames. It makes it so much easier to keep clean and clear if the product is used frequently...e.g. two or three times a week. Only glass cleaner I have found to work on my pellet stove glass and have been using it for 3 years. Sprays on evenly and wipes clean with paper towels. I recommend using protection on the floor under the glass and a mask as well as gloves. I Like that it's biodegradable. 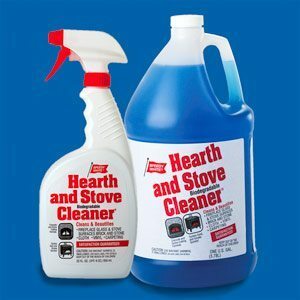 I have 2 other hearth/glass cleaning products on the shelf in the basement that will be thrown away because they are useless. Speedy White is effortless. Just spray on the glass and the soot dissolves. When I compare this product to the two others I’ve tried it’s unbelievable. The OTHER products do NOT remove any soot even if I soak the glass and scrub. Speedy White makes cleaning the glass fast (speedy) and easy. This product is the best glass cleaner that I've tried on my pellet stove. It's easy to use, and the glass stays cleaner longer than with other products I've tried. There's no reason to try a different product. I've used this product for a year or more and it is the only thing that will clean the inside of my fireplace glass. I've tried other remedies, but nothing compares. It still takes a little time and effort, but the glass is clean. 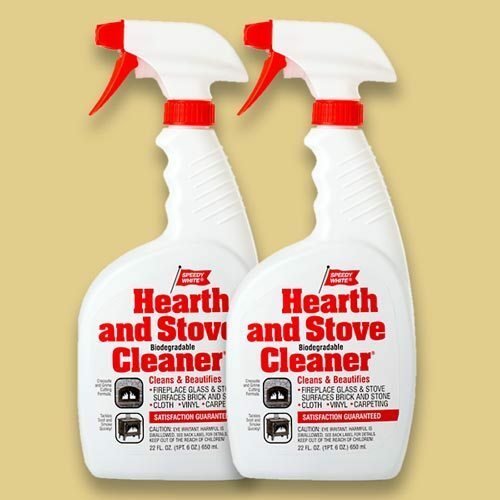 I used this product to clean fireplace stones. It did an excellent job without a nasty odor! This cleaner is the BEST. I was given a bottle when I purchased my soap stone wood stove 3 years ago. The only product I will use. Our glass on our wood stove cleaned up great. All we had to do was spray and wipe with paper towels. No streaks & looked fantastic. Great cleaner!!! I previously used this product purchased from the same store I purchased my wood burning stove, and knew it was a good product since then. 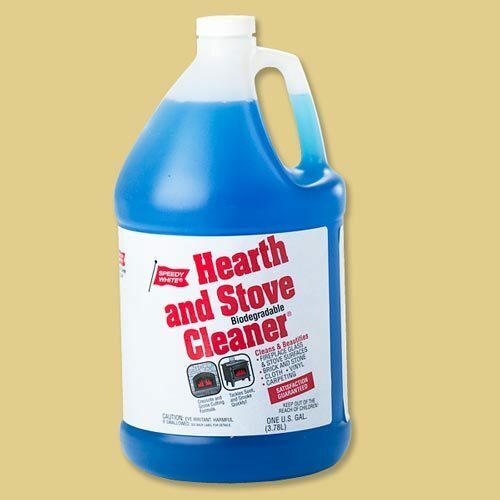 This is the only product that I know works well for cleaning inside of glass front on my wood burning stove. I strongly recommend this product. Honestly when I bought Speedy White, I didn't have much hope of it working. It was the last thing I thought I'd try before deciding to re-paint. Well, was I surprised! Speedy White works fabulously! It removed the smoke stains from the painted trim and the brick. Wonderful product!! Simply stated. this product is the only one that really works! Your stove glass will look like new again. Have been using this product for six years, would not be without it! 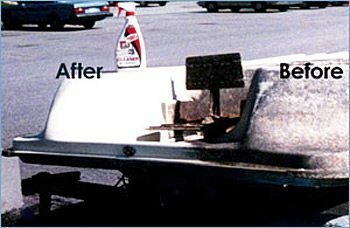 Yours is the best product we’ve ever found for cleaning the vinyl on our boat. The boat is 12 years old and vinyl is yellowing. Simple Green and professional vinyl cleaners don’t hold a candle to your product. Speedy White was soft on the vinyl, and soft on my hands. I want to tell you how very pleased I am using Speedy White to clean my brick front steps. The steps were very dirty and stained and I had previously tried several methods of cleaning with unsatisfactory results. With Speedy White, the results were super. I used less than one bottle. Thanks for such a superior product. I just wanted to tell you how pleased I am with your product. I used Speedy White on my fireplace, and it cleaned everything. I’ll be a customer for life! When we moved into our current home 2 years ago, the previous owners had left the rest of their Speedy White cleaner. It really is amazingly good at cleaning the glass doors and white stone of our fireplace. We use the fireplace almost daily in the winter, so I need to clean the doors and stone frequently (more often than I do because I was hoarding the cleaner I had). Anyway, love the product. It does what its supposed to do! I used your product on our 78 year old fireplace yesterday (and it looked like it had never been cleaned before – we just moved in) and Speedy White worked as promised. 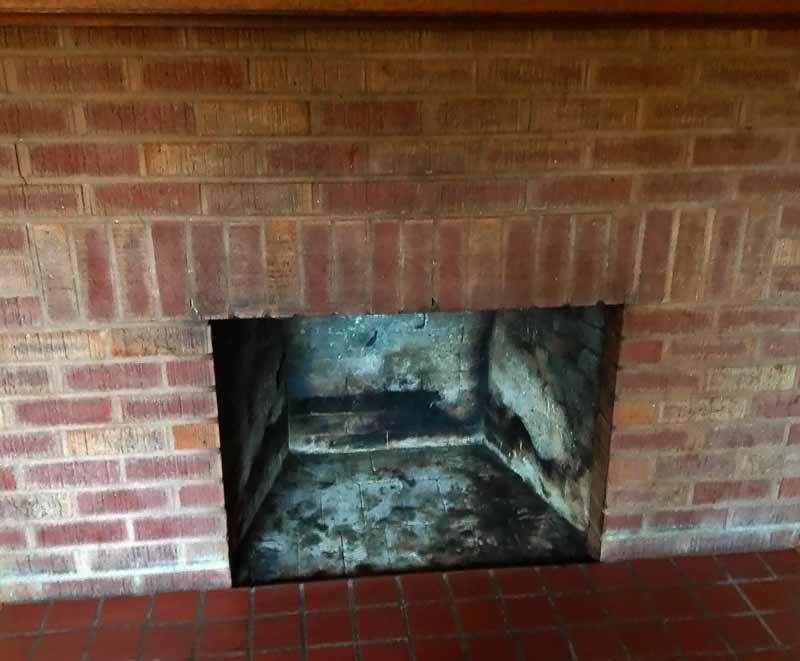 The firebox needed several applications because of the buildup of creosote but it really restored the brick on the outside of the fireplace, it was pretty much spray on, some minor scrubbing and the brick surround looked like the day it was built. Truly impressive and there was little odor- even less than the Simple Green I’ve been using on other parts of the house. My name is Buddy Dane, and I operate a business called Charleston’s Best StoneBuddy, Inc., in which I care for, maintain and restore natural stone surfaces. This includes marble, granite, limestone, etc. on floors, countertops, showers, whatever it is, if it’s stone, I can probably help it. Anyway, I got a call from a lady who has an old Huntsman wood stove in her family room. The stove sits on a flagstone hearth that goes up the wall and on the floor. Someone repeatedly burned treated wood and things in this stove until the creosote had dripped all down the pipe and all over the stone. This stove and flagstone are beautiful, and understandably the lady was quite distressed. After she tried every chemical she had under her sink to no avail, she got my number. I went out and looked at the job and after hearing her story thought there was not much I could do for her, but I told her I would look into it. After some research on the internet, I found no company on the net that would back up their product. I found Speedy White, read the testimonials, and was impressed. I ordered a gallon of Speedy White and waited for it. Once I got the gallon, I went to the lady’s house. I squirted the Speedy White on the creosote and watched it work. It was amazing. I actually watched the stuff work. My puddle of blue Speedy White quickly turned a nasty shade of black. After a few applications and a scrub brush, I had removed all the creosote. It was incredible. Not often do you find a product that not only works the way it is advertised, but better than it is advertised. I was this lady’s hero, and I owe it all to Speedy White, hands down. Sure I did the scrubbing, but if it weren’t for the Speedy White cleaner, this lady’s stone was ruined. So I had some leftover product which I planned to clean my grill with. My father called me and said he just bought some old PDQ cooker, which is an indirect heat charcoal cooker. I went to his house, and found him wire-brushing the inside of the cooker with simple green cleaner, but he couldn’t get the stuff off the grill. SO I BROKE OUT THE SPEEDY WHITE! In 15 minutes his grill was clean and he was on the internet ordering TWO more gallons!! We are hooked. I just want to say we need more companies like yours. Make a product, make it right, make it work, and you will make it. Thanks for everything, Speedy White. You’ve now got two more believers. Initially, I used Speedy White on a wood burning stove where it melted the soot and grime as advertised. One day, I ran out of Brand-X cleaner for some plastic lawn furniture and decided to see what Speedy White could do. The plastic came out spotless. I was amazed! Speedy White has now replaced Brand- X, Y, and Z cleaners!!! I use it, both straight and diluted per instruction, in every area of my home, shop, on the cars, and on an old airplane. I’ve recommended Speedy White with confidence to friends and family. It really “does it all”. Thanks again for a solid product, and I hope you stay in business for a long time! We had a wood stove installed in October and our installer gave us a complementary bottle of your cleaner. Our glass is still as clean as the first day it was installed. Your product is great! Once in a while a consumer comes upon a product that really works and does what it says it will do. Such is the case with your Speedy White Fireplace Cleaner. They told us about your cleaner after a month of scraping the glass on our doors to clean them, and we decided to try the product. We were thrilled after only one application at the ease with which the product worked. In only seconds, our glass doors were like new and sparkling clean. Our thanks and a round of applause to your company for this product. 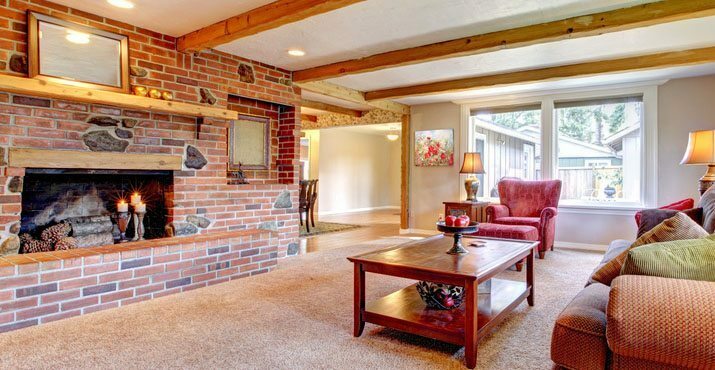 Your product is the ONLY product that I use to clean my natural white brick fireplace. It removed the soot and soil that accumulated over several years time. I am thrilled with your product. I used the phone number on the bottle to contact you. Thanks! I recently moved into my first house and was so happy to see that it came with a wood burning stove. Through association with friends, I was aware of the advantages of having such a stove. I began calling past occupants of the house and found out that the stove I have was at least 90 years old. The years of use and minimal maintenance were really showing. Soot, creosote and ash had really diminished the physical appearance of the stove.Having just moved into the house, I really wanted to show it off, so I decided to have a Super Bowl Party. The house really looked great, except for the stove. Two days before the party I went to Chesapeake Wood Stove Co. in the 4000 block of North Pt. Blvd. I browsed the shelves until I came upon a bottle of Speedy White. I asked the clerk if she had heard any favorable comments on the product and asked her if it would clean my stove without damaging the chrome trim. She assured me that Speedy White would do the job. I purchased the bottle and took it home. After getting home and reading the instructions and warnings, I began by spraying just a small area. After leaving Speedy White on the area for about 10-15 seconds, I wiped the area to find beautiful, shiny and clean chrome trim. Never in my wildest imagination did I believe it stove could look this good! Speedy White took a 90 year old, soot-covered stove and turned it into a conversation piece. After some more careful, detailed cleaning, the stove looked as good as the ones on the showroom of the stove store. Not often these days do you find a product that does what it says it will do. This time I got lucky, I got a product that exceeds expectations. That factor alone makes your product stand out. You have and your employees should be proud of your efforts. I highly recommend and endorse Speedy White to all my friends and anyone else who may have use for it.